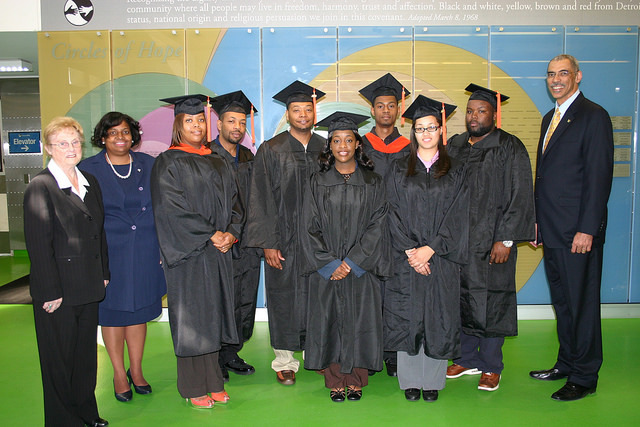 Focus: HOPE graduates have it all: Skills and good work habits! Focus: HOPE graduates have the full package: superior work knowledge and skills as well as excellent work habits. Our career training programs emphasize both. We stress academic preparation as well as hands-on learning. Concepts taught in the classroom are reinforced by actual work experience. All Focus: HOPE programs stress communication skills and computer literacy, as well as the importance of good attendance, getting to work on time, and maintaining a positive attitude. All our students must have a high school diploma or GED, pass a reading and math examination, and pass a drug screening test. Students in our information technologies certification and college degree programs are available for internships, as are students in the engineering college degree program. Our Job Placement office can help you find qualified employees in the areas of engineering, information technology, manufacturing, weatherization and health care. If you are interested in hiring one of our graduate, please contact 313-494-4396.